4-Word Review: Eccentric people of Texas. David Byrne the founder member of the influential Talking Heads rock group tries his hand at filmmaking, which to date has been his only directorial foray of a feature film and not including two documentaries that he did in the late 80’s and early 90’s. This film centers on weird characters that were inspired from tabloid magazine stories and the list of eccentric people include The Lazy Woman (Swoosie Kurtz) who is so rich that she never needs to get out of bed and has a wide array of servants or robotic hands to help her do everything. There is also John Goodman as a single man desperately seeking a mate, Jo Harvey Allen as a chronic lying woman and Alix Elias as The Cute Woman. The film starts out with promise. Byrne focuses on interesting symmetrical designs and colors. I also liked how every other shot seems to focus on the vast flat emptiness of the Texas landscape as well as showing rows and rows of steel sheds something that no other filmmaker would think of doing, which helps give this a unique vision. The humor is consistently offbeat and amusing with my favorite moment coming during a fashion show where the runway models are shown to wear increasingly more outlandish outfits all to the excitement of an enthusiastic audience. Byrne’s parody of driving his car in front of a blue screen is also quite funny. Goodman is a delight not only when he gets behind the microphone and sings ‘People Like Us’, but also his TV-ad looking for eligible women. Kurtz is quite funny too especially with her entranced look while watching banal and inane TV-shows. Spalding Gray adds a good presence and the scene where he tries to create the layout of a town while using food at a dinner table is great. Unfortunately the film ends up being a misfire mainly because it has no real plot to speak of. The quirky ideas and goofy characters are wasted in a directionless movie that goes nowhere. Certain innovative touches like having a group of children coming out of an empty field to sing a song become confusing and pointless. Byrne’s own presence as an onscreen narrator quickly loses it welcome and eventually becomes annoying. It manages to come together a little during the last half-hour with some much needed cohesion, but it is not enough to save it. 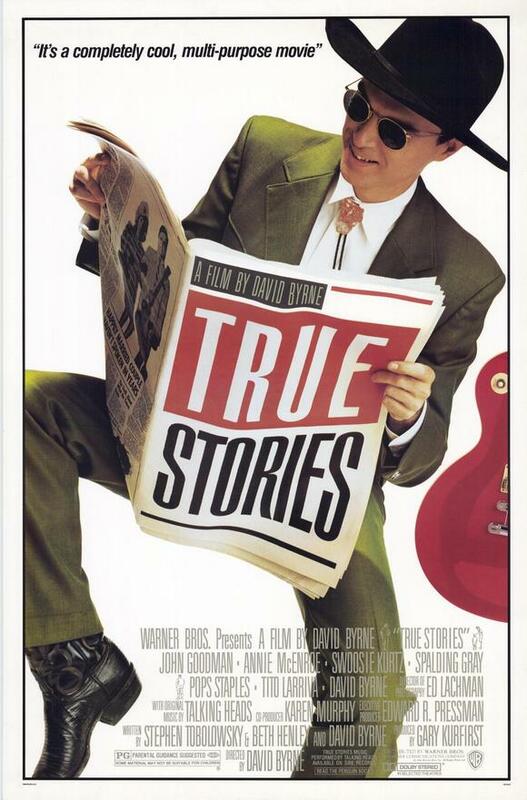 This entry was posted in 80's Movies, Movies that take place in Texas, Musical, Parody, Quirky and tagged David Byrne, Entertainment, John Goodman, Movies, Review, Spalding Gray, Swoosie Kurtz. Bookmark the permalink.